My Morning Routine: Luke Ditella | Valet. "Summer means outside hose showers for me." Ask 10 people to take one look at Luke Ditella and guess his profession, and you might get 10 different answers. Woodsman, blacksmith, Civil War-era movie stand-in. Suffice it to say, not many would guess professional surfer, model and in-demand tastemaker. And while the beard evokes a blue-collar aura, Mr. Ditella is as comfortable in a Rolls Royce on 5th Avenue as he is tearing up the waves on the New Jersey coastline. It's this renaissance approach to life that has earned him many a lucrative modeling and ambassador gigs (count American Crew, Tom Wood, Shinola, and Abercrombie on his resume), and what attracted Lab Series to the world traveler. Between the constant globetrotting, various business ventures, acting and modeling, things can get hectic. So we hit him up to talk about how his morning routine keeps him centered and focused. Depending on the previous day/night, I try to wake up and start my day around 8 am. Sometimes it happens and sometimes it doesn't. I target 6-8 hours of sleep. But, like most people, it's less most of the time. The first 60 minutes is definitely the strangest part of my morning. I kick things off with a shot of apple cider vinegar and a few glasses of water right away. Oil pulling comes next to release toxins and help fight bacteria, followed up with my red eye coffee (shot of espresso + cup of coffee). Emails, of course, are being read and answered throughout this process. I like to get outside first thing in the morning, so I usually get my red eye from a local cafe. Occasionally, if things are really crazy, I'll just make it at home. It's rare that I eat breakfast. I've been that way my entire life. I don't really follow the three meals a day plan. Honestly, I just eat when I'm hungry, and that's it. The the most important part of my morning is all about visualizing success and creating positive energy. I try to mentally prepare positivity and let my inside world dictate the outside one, rather than the other way around. My grooming routine is pretty bare bones. But I swear by quality products. 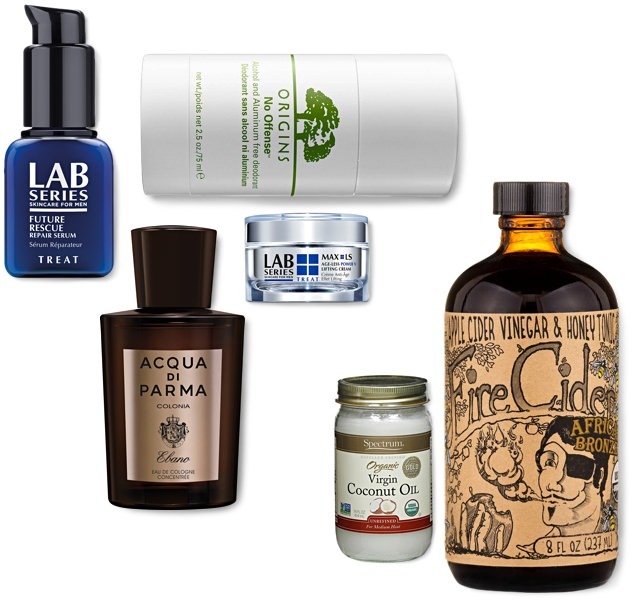 Simple coconut oil for various uses, old school Italian cologne, aluminum-free blackcurrant deodorant and a range of Lab Series products. Timelessness is important to me. Money, in my opinion, can't buy good style. It can buy fashion. I try to find clothes that are cool now, were cool ten years ago, and will be cool ten years from now.